The question “what can Japan learn from Quebec?” is quite interesting. One thing Japan can learn is how to manage a city to make it a “creative city” like Montreal. In some sections of Montreal, there are　empty buildings and factories, and a number of artists are moving into those places, because of low rents there and financial support for artists in the city. One result is the emergence of a city of multi-media within Montreal. The key point is how to change functions of some sections of the city to accommodate artists and other people in the so-called “creative class.” By learning from this experience in Montreal, Japan can manage the old sections of its cities to make them more creative than otherwise. Another thing that Japan can learn from Quebec is how to enrich daily living for city residents. For example, the City of Montreal has a number of empty lots, which are used as community gardens to be rented out to its residents. The City provides some management, but it is loose enough that residents can use them freely as their gardens. In fact, this practice of community gardens has become a kind of movement, now spreading to various parts of the world. Similarly, “mosaic culture” is a movement, originating in Montreal, where residents can work on some arts such as sculptures in a public place. Actually, this has become a big event, which was held in Shanghai last year, and will be held in Hamamatsu next year. Community-level exchange from the international perspective is also something Japan can learn from Quebec, where various NGOs are quite active in supporting community affairs in developing countries. For example, Cirque du Soleil, which is based in Montreal, has become a well-known organization worldwide, and it is also committed to community-based volunteer work to help improve welfare in communities overseas. Just recently, it has launched an NGO, named “One Drop,” which will be contributing to the development of water access in Africa. On the Japan side, there seem to be interesting community developments such as coop activities among elderly people, and foreign observers are interested in what is happening in Japanese communities. In Japan, however, there are relatively few communities that are open to the outside world. 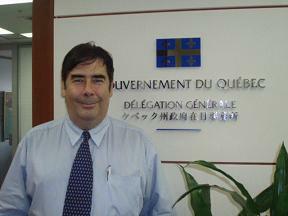 By learning from Quebec, Japan should have more open community developments and interactions. Finally, multi-cultural, multi-linguistic communities should be more fully developed and utilized in Japan, as in Quebec. While there is a Japanese way of educating its elite class, what is lacking there is a multi-cultural approach to train them to be global leaders. In this respect, Japanese education should become more diverse and liberalized, and more parent involvement needs to be encouraged. At the same time, Japan should be more open to immigration so that foreign language communities can be integrated into the mainstream of Japanese society. This would benefit both foreigners and Japanese in many ways. 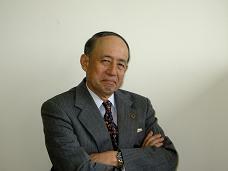 Prof. Takahiro Miyao (International Univ. of Japan) lecturing in "Contemporary Quebec"
"What Can Japan Learn From Quebec?" On January 15, invited by Prof. Obata, I gave a lecture in his "Contemporary Quebec" course, mainly asking students the following question: What do you think Japan can learn from Quebec? 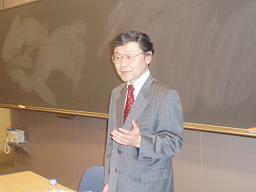 In the first half of the lecture, the interviews on the Japan-Quebec Blog (http://japanquebec.blog76.fc2.com) were explained, especially focusing on what the interviewees thought Japan could learn from Quebec. And then the students were asked to write down what they themselves think Japan can learn from Quebec and submit it right away. Cultural policy (14), Education system (8), Language policy (7), Pride/identity (3), Immigration policy (2), Work-life balance (2), PR overseas (1) -- an interesting and illuminating result! Executive Advisor, New India Assurance Co., Ltd. I started traveling to Quebec on business, when I was stationed in Toronto, mainly covering Ontario and Quebec Provinces as Director and General Manager of Tokio Marine Management Ltd. in the deecade of 1980. Since then, I have been interested in Quebec, as I made friends with Mr. Robert Keating and other members of the Delegation Office of Quebec Government in Tokyo, after I returned to Japan. At the same time, I joined the Japanese Association for Canadian Studies (JACS; http://www.jacs.jp/), and have been doing research on the Quebec economy, especially from the viewpoint of comparison between Quebec and other provinces. Based on my research, I sometimes make presentation at the JACS Conferences and other meetings, and often teach courses on Canada and Quebec at Meiji University and other colleges. One of the points that I often emphasize in my presentation is as follows. A commonly held belief, particularly among Japanese businesspeople, that “the Quebec economy was adversely affected by the francophone-led cultural policy which facilitated the exodus of anglophone business and human resources to Ontario and other provinces” does not seem to be supported by evidence. The fact is that, owing to such cultural policy in Quebec, many francophone Canadians have regained confidence in themselves and returned to Quebec, especially gathering in and around Montreal, affecting the Quebec economy in a positive way. Actually, various industries such as manufacturing, warehousing, transportation, R&D, etc. have recently been flourishing in satellite cities and towns near Montreal along the national borders, positively contributing to the development of the Quebec economy as a whole. From Japan’s standpoint, those industries located in the Montreal region, such as aviation-related business, transportation and marine equipment, movie business, 3D animation, and drug research & development, seem to be complimentary with Japanese industries and, therefore, it would be mutually beneficial to interact with each other. This is one of the main differences between Quebec and other Provinces, where their trade with Japan tends to be “unilateral” with natural resources exported to Japan in exchange for consumer electronics, automobiles and various components. Needless to say, there are a number of problems with Quebec. Just like any other Canadian province, over 80 percent of the Quebec economy still depends on the U.S., however hard they have tried to develop their own business, and social problems seem getting worse, especially among young people, due to the collapse of traditional moral values. As for problems unique to Quebec, population tends to stagnate in Quebec Province, that is the francophone region of Canada, compared to the anglophone region, which is attracting more immigrants. As a result, Montreal has been surpassed by Toronto in terms of population for some time, and could be caught up with by Vancouver in the foreseeable future. Furthermore, there is a problem of widening economic gaps between prosperous Montreal and other cities along the southern borders on one hand and the northern region depending solely on primary industries on the other. A problem for Japan, rather than for Quebec, is that Quebec and other provinces are trading more with China than with Japan these days, and Chinese imports are becoming more and more visible everywhere in Canada. As a result, Japan’s presence in Quebec or in Canada as a whole, seems to be fading, at least relatively. So, Japan needs to consider how to appeal to Quebec and Canada for that matter in order to maintain and improve the mutual relationship in the future. In conclusion, there does not seem to be any major problem with the Quebec economy, which should be developing nicely with its originality and uniqueness, due to the abundant supply of excellent human resources. In a sense, that is an intended result of educational policies with emphasis on culture, languages, and arts, which have been adopted since the “Silent Revolution” terminated the old educational system under the control of the Catholic Church in the 1960s. In this regard, Japan can learn much from the Quebec experience, when it comes to “educational reform.” It is important for Japan to train human resources by emphasizing culture, languages and arts, which have rather been neglected in the past. I myself am teaching at a college in Osaka, using English as the official language on campus, where students are studying hard in response to teachers’ sincere efforts to teach them in the foreign language, promoted by the college as a whole. We can make Japan-Quebec relations better and closer, especially in the educational and cultural fields, for example, through student exchange programs, in the future.